Last week temperatures ranged from 4 degrees below normal to 2 degrees above normal. Precipitation was less than an inch for the state, with most areas seeing less than ¼”. Base 50 growing degree-days ranged from 20 to 70. Today mostly sunny and warm with temperatures will in the upper 70’s and 80’s. Isolated afternoon showers and thunderstorms are likely. Overnight lows will be in the upper 50’s and 60’s. Friday will be mostly sunny and warm again in the 80’s, even 90 possible. Scattered thunderstorms are possible in the afternoon. Lows will be in the upper 50’s and 60’s. Saturday temperatures will be in the upper 70’s to 80’s, 90 possible, with isolated afternoon showers and thunderstorms. Overnight temperatures will be in the mid to upper 60’s. Sunday’s highs will be in the mid 70’s to mid 80’s. Isolated afternoon showers and thunderstorms are possible. Overnight temperatures will be in the mid 50’s to low 60’s. Monday temperatures will be slightly cooler in the 70’s, some low 80’s, with an increased chance of showers and thunderstorms from a cold front. Lows will be in the mid 50’s to low 60’s. Tuesday will be in the mid 70’s to low 80’s with a continued chance of showers and thunderstorms. Lows will be in the upper 50’s to low 60’s. Wednesday will be in the 70’s and some low 80’s possible. Lows will be in upper 50’s to low 60’s. The five-day precipitation amounts will range ¼” to over 1 ½”. The 8-14 day outlook (June2-8) shows equal chances for above or below normal temperatures fro all but the southeast corner of the state that has an increased chance (33-40%) of below normal temperatures. Most of the state has an increased chance (33-40%) of above normal precipitation. June outlook shows increased chances (40-50%) of above normal temperatures for the entire state. There are equal chances of above or below normal precipitation. The June/July/August outlook shows increased chances (50-60%) of above normal temperatures for the entire state. There is an increased chance (33-40%)for above normal precipitation in the northeast portion of the state. The Drought Monitor: Abnormally dry conditions have expanded in the Adirondacks due to short-term precipitation deficits, low streamflows, and dry soils. Northern NY. 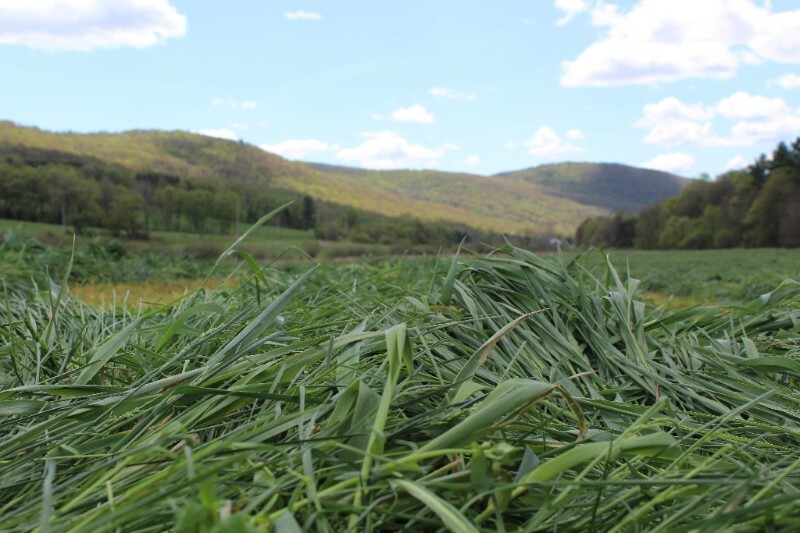 The Northern New York Agricultural Development Program has posted the results of a 2013-2015 research project evaluating ways to improve dairy cattle forage options, specifically with alfalfa-grass combination crops. The results are posted on the NNYADP website at www.nnyagdev.org. Alfalfa-grass mix crops are popular as forage for dairy cattle in the Northeastern U.S, especially so in northern New York where more than 95 percent of the alfalfa acreage is planted as an alfalfa-grass mix. Cherney cites Cornell University and University of Wisconsin research trials that concluded alfalfa-grass forage fed to dairy cows can result in as much milk production as feeding pure alfalfa. ‘An alfalfa-grass survey we conducted in New York State in 2015 showed a range of grass species planted, and a very wide range in seeding rates for both alfalfa and grass, well outside recommended rates,’ Cherney notes. NNYADP-funded trials planted in 2013-2015 at Miner Institute in Chazy, NY, and at the Willsboro Research Farm in Willsboro, NY, provided initial data on eight grass cultivars. Those trials showed the severe impact that northern New York winter weather can have on crops. 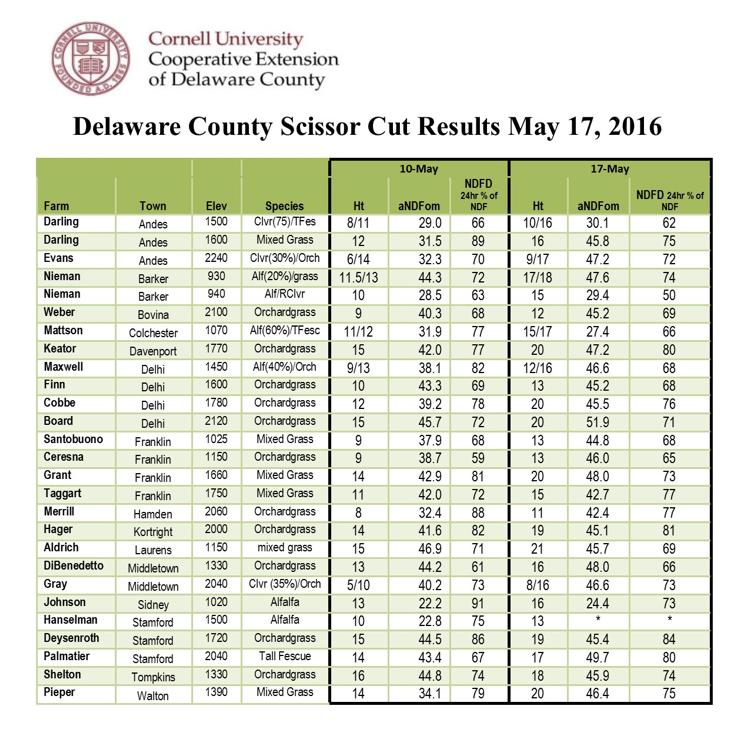 The grass plantings in the early trials in NNY, however, averaged 3.5 percentage units higher in neutral detergent fiber digestibility, NDFD, a measure of the feed value of forage crops. High NDFD forages encourage dairy cows to eat well to meet their daily energy needs. ‘With new higher quality grass options and several new types of high quality alfalfa available, we want to test various combinations on farms to develop the best planting and management strategies for the dairy industry,’ Cherney says. In 2016, Cherney is overseeing trials on NNY dairy farms to continue the search for the best alfalfa-grass combinations and management practices for the northern New York state climate and growing conditions. 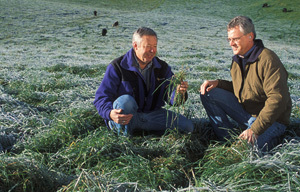 Cherney is particularly focused on meadow fescue, which is winter hardy, as an option for alfalfa-grass stands. He will plant two new meadow fescue cultivars recently developed in Wisconsin in the 2016 field trials funded by the farmer-driven Northern New York Agricultural Development Program. Funding for the Northern New York Agricultural Development Program is supported by the New York State Senate and administered by the New York State Department of Agriculture and Markets. NNYADP economic impact reports, project reports, and resource links are posted on nnyagdev.org. More than 100 farmers provide input to the Northern New York Agricultural Development Program on dairy, crops, fruit, greenhouse, livestock, maple and vegetable production. Seneca Falls, NY. The New York Center for Agricultural Medicine and Health is bringing the National Education Center for Agricultural Safety, NECAS, grain bin simulator to New York State for the August 9, 10, and 11, 2016 Empire Farm Days. Firefighters and rescue personnel will have a free, four-hour, hands-on training opportunity after the show closes on Tuesday, August 9, and Wednesday, August 10. The free training from 6 pm to 10pm is with NECAS Director Dan Neenan, a Paramedic Specialist with a Firefighter Specialist degree. The training includes one hour or classroom time and three hours of hands-on experience with the grain bin rescue unit filled with 100 bushels of corn. Trainees will practice lockout, tag out, and extrication of engulfed victims. Registration for the special training is required by contacting Jim Carrabba with the New York Center for Agricultural Medicine and Health at 800-343-7527 extension 2216 or jcarrabba@nycamh.com. Throughout each day of Empire Farm Days, Neenan will offer 20-minute safety education demonstrations at the grain bin exhibit at the largest outdoor agricultural show in the northeastern U.S. He ill cover the four most common ways people become entrapped in grain bins, the equipment every bin operator should have on site, and how to protect yourself from grain dust and mold when working near a bin. The demonstrations and special training opportunity are sponsored by the New York Center for Agricultural Medicine and Health, the National Education Center for Agricultural Safety, and Empire Farm Days with additional sponsorship provide by Farm Credit East and the NY Farm Bureau Member Services Safety Group 486. Find more information on the training opportunity and on Empire Farm Days online at www.empirefarmdays.com. Last week temperatures ranged from 2 to 4 degrees below normal for most of the state. Precipitation ranged from ¼ inch to 1 inch for most of the state. Base 50 growing degree-days ranged from 5 to 45. Today a few afternoon showers and thunderstorms will be possible (small hail possible), temperatures will in the mid 50’s to upper 60’s. Overnight lows will be in the mid 30’s to mid 40’s, frost possible. Friday will be mostly sunny with highs returning to normal – in the mid 60’s to mid 70’s. There is a slight chance of showers in southern areas. Lows will be in the mid 40’s to low 50’s with light showers possible in southeast NY. Saturday temperatures will be in the mid 60’s to mid 70’s. The weather will be a mix of partly sunny and dry to partly cloudy and light showers. Overnight temperatures will be in the mid 30’s to 40’s. Sunday will be partly to mostly sunny with highs in the upper 60’s to mid 70’s. Isolated afternoon showers are possible. Overnight temperatures will be in the upper 40’s to low 50’s. Monday temperatures will be in the 70’s with a slight chance of showers in southeast NY. Lows will be in the 40’s. Tuesday will be in the 70’s with a slight chance of showers. Lows will be in the 40’s to low 50’s. Wednesday will be in the 70’s and some low 80’s possible. Lows will be in the 50’s. The five-day precipitation amounts will range from 0 in western NY to ½ inch in the Catskill/southern Hudson Valley region. The 8-14 day outlook (May 26 – June1) shows increased chances for above normal temperatures for all of the state. Near normal precipitation is expected for the western half of the state, and there is an increased chance of below normal precipitation for the eastern half of the state. June and May/June/July outlooks shows increased chances of above normal temperatures for the entire state. There is equal chances of above or below normal precipitation. The Drought Monitor: Abnormally dry conditions have slightly expanded in upstate NY where short-term (30-day) precipitation deficits exist and stream flows are below normal. Most winter malting barley fields from Niagara Falls to the Hudson Valley are in the boot to heads fully emerged stages. Despite the common dogma that anthers begin to be extruded on barley heads before the heads emerge, we are finding that the majority of just emerged winter barley heads in New York aren’t showing anthers until a few days after emergence under our unseasonably cool conditions. Temperature and varietiy play a more important role in anther development than I previously realized. Still, based on the preponderance of experimental evidence, the best time to apply triazole fungicides for Fusarium head blight (FHB) and deoxynivalenol (DON) mycotoxin suppression is within a few days after full head emergence. We have observed low levels of powdery mildew, spot blotch, scald and trace levels of barley leaf rust in New York. This will be a critical week for foliar fungicide application to barley and I urge close observation of crop development and weather forecasts. Winter wheat in New York is at stem elongation to flag leaf visible stages, so flowering is still about two weeks off. The triazole products Caramba and Prosaro are the most effective fungicides for suppression of FHB and DON contamination when applied at flowering (emergence of anthers on heads). A flowering application of triazole fungicide should be based on Fusarium head blight (FHB) risk as well as the risks of powdery mildew, rust, and fungal leaf blotches in the upper canopy based on scouting of individual fields. We have observed low levels of powdery mildew, Septoria tritici spot, and trace levels of wheat leaf rust in New York. There is an application window of approximately 6 days from the beginning of flowering in which reasonable FHB suppression can be expected. Fungicide products containing strobilurins should not be applied to headed wheat or barley as they may result in increased levels of DON in grain. While the current risk of FHB epidemics is low over most of the state, that risk could increase. Check the Fusarium Risk Assessment Tool (http://www.wheatscab.psu.edu/) and your local weather forecast frequently as your crop approaches heading and flowering. 5 How to Monitor Alfalfa Weevil in Alfalfa. Last week temperatures were below normal again, by 2 to 4 degrees across most of the state. Precipitation ranged from less than ¼ inch in western NY to over 1 inch in a few isolated areas. Base 50 growing degree-days ranged from near zero to over 20. Today high pressure will provide dry and sunny conditions. Temperatures will be above normal, throughout the 70’s and some areas reaching 80. Afternoon thunderstorms are possible in western areas as a cold front approaches and will bring overnight showers moving west to east over the state. Overnight lows will be in the mid 40’s and 50’s. Friday will be cloudy with rain likely as the cold front passes. Highs will be in the 60’s, with some low 70’s. Eastern areas of the state will warm before the front moves in. Lows will be in the mid 40’s to low 50’s. Saturday will be cloudy with showers as another cold front moves through. Temperatures will be in the mid 50’s to low 60’s, eastern areas will reach upper 60’s. Overnight temperatures will be in the mid 30’s to 40’s with light wet snow possible. Sunday will be partly cloudy and cooler yet with highs only in the mid 40’s to mid 50’s. Showers are still possible as they move out of the state. Overnight temperatures will be in the mid 30’s to 40’s. Monday temperatures will be in the mid 50’s to mid 60’s. Lows will be in the mid 30’s to low 40’s. Tuesday will be in the upper 50’s to low 60’s. Lows will be in the mid 30’s to mid 40’s. Wednesday will be in the mid to upper 60’s. Lows will be in the 40’s. The five-day precipitation amounts will range from ½ to ¾ inch in the Catskill/southern Hudson Valley region up to 2 inches in northern NY. The 8-14 day outlook (May 19-25) shows increased chances for above normal temperatures in western NY and equal chances of above or below normal temperatures for the rest of the state. Near normal precipitation is espected for the entire state. The Drought Monitor: Abnormally dry conditions have expanded in the Hudson Valley/Eastern Plateau regions and a new area was added in northern NY.